To set up a mail client it’s necessary to configure an SMTP server that will take care of the delivery of your emails. Luckily, the configuration of SMTP servers is generally very easy – you will simply have to open your email software and add the right SMTP parametres in the settings windows. That’s why we recommend to choose a professional SMTP service: with turboSMTP you can register and get a lifetime package of 6.000 free relays per month, then in case choose the plan that best suits you. 1. Select the voice “Account Settings” in your mail client, generally in the “Tools” menu. Description: an informal name that you will decide to identify the server (best to use the email provider’s, like Gmail or Yahoo). Server Name: the actual SMTP server’s specification. You can find it either consulting the web page of your provider, or searching for it on our list of server POP and SMTP. Port: usually SMTP works with port 25, but as the screenshot shows it can work also with 587. For further information, check out our article about SMTP ports. 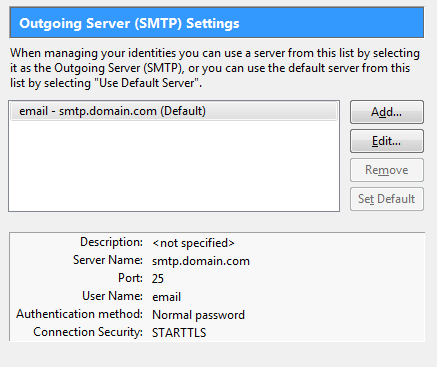 Connection security: in itself, SMTP email transfer doesn’t provide an encryption. So if you want to make your connection more secure, it’s a good choice to use a STARTTLS or SSL/TLS extension, that employ a separate port for encrypted communication. 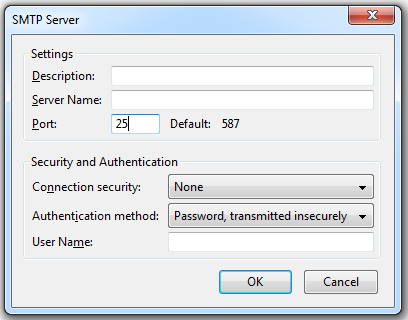 Authentication method: there’s a certain number of methods (passwords, CRAM-MD5, KERBEROS etc. ).